I actually don't like to munch while I'm at work, it makes me fatter. Really. But the problem with me is, when I see know there are food/snacks (right underneath my drawers), I must faster finish them. So you may say, the best is I don't buy any and refill the jars once I've finished them, BUT (but but but) I still buy and stock them up because it makes me feel "more secured" when I'm at work. Laugh all you want, yes, I feel "more secured" when I have food inside my drawer. Anyone here same with me ahh? Good morning, Louiz! Aiyo I cannot do that. If I have snacks in my drawer or workstation or anywhere within 20 feet radius, I have to eat them. Cannot tahan especially those crispy and crunchy snacks. So no, I don't have any in the office or even at home (except the naughty candied bacon but mou chor already) because I know the consequences hee..hee.. So all that you munch in the office or you let your colleagues eat? Of course all I munch, no sharing.. If they see, I pretend to close the lid and put it back in my drawer, haha..
My office also has the same female colleagues like you who often scared me with their junk food like dried squids, jackfruit crackers and durian kopi. Adoi, all the smell but no one cares. I stopped snacking too as I agree that it was fattening so I only have coffee sachets in my drawers. Just enjoy lah, fat fat so what? Fat fat later not pretty liao lor.. Hehehehe.. Yep, I always always have snacks in my drawer la.. The Tiger biscuits finishing soon, I will have to stock up again this weekend during my grocery shopping.. I am the same, if I know there are snacks available, I have to finish eating them. It doesn't feel right to leave the snacks alone :D .. That's why I don't stock up now. Good thing is the company has an in-house convenience store, so whenever my mouth itchy, I will just drop by to grab Pringles or more recently, Pepero. Prince charming, same here! You know, i have a BIG packet of Mamee too, inside got 12-15 smaller packs inside one, you know what I mean right.. Colleagues ask me the same thing too, but I think I'm very selfish, I would think, if I eat one big pack, I have to share.. If I just eat a small pack one at a time, nobody would ask coz the packet is already so small..
Hello Ania (hope I'm right), nice meeting you and thanks for visiting my blog..
Glad I'm not alone.. Yeah, I got out of control at one time.. I had instant mushroom soup packs, instant porridge packs, all kinds of junk food like Twisties, Roller Coaster, choki-choki, Zip chocolate bars, the list goes on.. It became out of control.. Really..
Aiyo ... you take replacement meal drink and yet snacks so much !! Hahha... why not. You try the amway meal replacement drink called positrim ? It's great too. Ya wor, like not logic.. Take replacement meal but then snack so much.. Gained back all the weight.. Sigh.. No try Amway wor.. 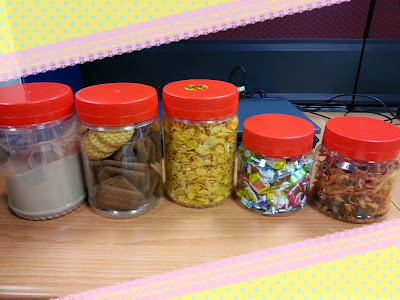 Currently just Usana..
i dun usually keep food at workstation coz similar to u, i will try to finish them when knowing there is some food in the container....So, nowadays i dun make it a habit to munch food when working, other than sweets & chewing gum...haha! but that is only occasionally when im on sugar low situation. Yep, I tell myself the same thing.. After this batch finishes, I'll just stock up on sweets and gummy stuffs like Mentos..
Hahaha those snack jars look familiar, same like what I have in my stash. Except I keep more 3in1 white coffee satchets, collagen satchets, coco crunch, milk premix with nestum, and mentos. You never know when you'll be stranded in the office and need food right? lol. Our office pantry is also well-stocked so I'm sure controlling weight around here is very difficult. The pantry has Milo, so previously I stock up on Nestum and Quaker Oats.. But I don't enjoy those, so I changed to goreng-goreng stuffs like fried crab sticks, keropok, Mamee and Tiger biscuits, feel more satisfying than corn flakes and Nestum, teehee.. Yes, clever boy, those containers, aiya, sekali pandang, already know it's from CNY cookie jars la.. Yep, all recycled.. Put in office, never take home.. When I buy new biscuits, then I re-stock into the jars lor.. I occadiobally got put some snacks in office lor, like you, it feels more "secure" to have something there la.. though many times when too focus on work, won't even think of snacking but then when free a bit ah, the urge molala comes and really I'll hunt up and down for snacks geh lor..
Me not molala wor, me is everytime addicted to it jor wor.. Just like now, as I'm typing this, I'm munching on Tiger biscuits.. I've already had char kuey teow and bachang la, and now, munching on biscuits somemore leh..
My girl and my missus are into snacks...like when watching TV, not me. A ladies' thing, perhaps? I think so, maybe, haha.. Coz the guys here don't keep snacks in their drawers.. Only ladies.. Hmmm, maybe you are right.. I also try to buy those with individual/smaller packets those kinda packaging when I shop for biscuits/tid bits.. But hor, those are more expensive one leh.. Like soda peang, you buy one big packet without individual packets ahh, more cheap ger wor..
your snacks okay mah not too "jaap".. mine can be anything lor, coz you know I eat by packets so no storage issue mah, hahaha!! so can be buscuits, cookies, chocolates, sweets, cakes, breads, junk food like oya and Twisties and potato chips etc etc.. like that happier to see new varieties coming in mah.. Previously, it was too "jaap", and I got out of control.. I had: Instant mushroom soup, Chipsmore, butter cookies, Mentos, M&M's, Mamee, Roller Coaster, "baby brand" murukku, London swiss rolls, Cocopie snacks, oh dear, it went out of control.. Cannot jor.. I feel fat just by reading your snacks selection! oh..I don't do that. I probably hv some honey lemon sweets to soothe my throat as I talk a lot at work. After this batch of snacks finish, I will just stick to sweets.. Out of control, very susah..
wah youi have so many munchy in your work station ah.? Last time my boss see sure we kena from him. My worksation no munchy la. only have packet of tea and coffee coz pantry always habis stock. After this batch habis, I will only keep sweets la.. If continue to stock on these munchies, out of control wei.. Get fatter faster too.. In my workplace I only have milo and cream cracker. I also dont really munch much. Pantry got milo only.. So I bring my own snacks and biscuits.. But after this batch finish, I'll try to stop.. Ya ya agree! I tried NOT bringing snacks to work (before I started storing them in jars) but when really mouth itchy and hungry, hou sanfu.. When really mouth itchy, I dont want milo ger wor (pantry has milo), I wana bite bite ger wor..
hahahaa.... You terror!! For me one plastic tin only...cookies! Only when mouth itchy.... and oats in the fridge..that's all.. you win!! hahaha.. I win one time only.. After this batch finish, I will STOP.. Getting fatter little by little everyday jor.. I am the same as you. I always bring 7 slices of wholemeal bread and 3 packets of assorted biscuits with me to work daily. I don't store any in the office. Maybe after this I can follow your method - bring individual packets of snacks instead of the whole thing store in office..
My drawer has coffee sachets, oat milk, cream crackers and that it is. No junk food or titbit at all. I scare I can't resist and tend to munch in the office. No good for my waistline. Ya ya, agree.. Get fat very fast one I know.. After this bath finishes, I will just stick to the sweets. Hehe.. I try not to have any. Because. If I see them, I will eat them! Same here.. When I see them, I must faster finish them.. So the best is I dont stock up.. Maybe just on sweets.. I don't eat a lot of snacks but I eat a lot of bread! I'll buy bread from the bakery and eat A LOT (more than you can imagine). I can munch on pastries all day long. I sometimes eat chocolates too.